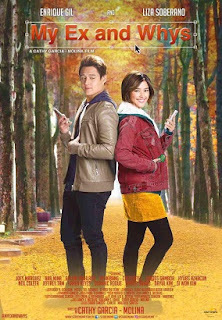 The most awaited movie of the year, My Ex and Whys, starring the trending love team in the Philippines, Liza Soberano and Enrique Gil. 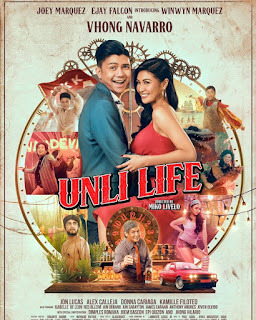 Directed by Cathy Garcia Molina under ABS CBN Film Production Inc., was out in the cinemas last February 15, 2017. The love story of Cali ( Liza Soberano) and Gio ( Enrique Gil) started when they met in a friends party, after playing seven minutes in heaven and they started to see each other. One day, when Cali's father left with his mistress being devastated and went calling Gio, to her surprise it was answered by a girl claiming that Gio is busy right now because they're both making out. Adding insult to injury, Cali was heart broken and ended her relationship with Gio. After few years, Cali is a blogger, and owns ' The Bakit List' blog, containing bitterness towards a man that cheated on her. On the other hand, Gio have his own blog entitled, 'The Dahil List' a respond to every blog of Cali. Both of them met again in an event for a certain book author. Gio grab the chance to prove to Cali that he is a change person. But Cali has another plan, with her friends help, they came up with a plan to sabotage Gio but it wasn't successful. Another event came up when the two exes was invited to a wedding of a common friend in Korea. Cali took this opportunity to give Gio a revenge he deserves and this time it was over the line that it destroyed the whole wedding. Cali admitted that it was her fault and promise she will fix it. Gio lend a helping hand. And in the search of the run away bride the two became friends again. And so the wedding proceeded. Back in the Philippines Cali was remorseful and admitted her wrong doings towards Gio. She deleted her blog and search Gio, to give another chance. A bitter, stoned heart can only be healed by loving again and this time to be loved by the same person again. The movie describes the cliché love conquers everything. It is overrated but let's admit it still make us hopeful and kilig. The love team really have the chemistry and the scenes in Korea was wonderful. It is indeed a movie for all, because love knows no age anyways.